Tony Romo is retiring rather than trying to chase a Super Bowl with another team after losing his starting job with the Dallas Cowboys, a person with knowledge of the decision told The Associated Press on Tuesday. The all-time passing leader for the storied franchise is headed to the broadcast booth after spending weeks considering those offers, the person said. The person spoke on condition of anonymity because Romo's decision hasn't been announced. Romo's departure from Dallas has been the most likely outcome since November, when he returned after missing the first 10 weeks with a back injury. He conceded the starting job to rookie Dak Prescott with the Cowboys in the middle of a franchise-record 11-game winning streak. Cowboys owner Jerry Jones told Romo before free agency opened that the team would release him to give him a chance to continue his career with another contender. But Dallas decided at the last minute to try to generate interest in a trade. That move gave Romo more time to consider retirement, and the likelihood appeared to grow when he played in a golf tournament last week. Romo, who turns 37 this month, had given up his favorite hobby after a series of back injuries that included two surgeries in less than a year. His playoff debut a little more than 10 years ago illustrated the playoff struggles ahead when Romo infamously flubbed the snap on what could have been a winning field goal in Seattle. A year later, the Cowboys lost their playoff opener to the New York Giants as the No. 1 seed in the NFC, a defeat that stung even more for fans because Romo went to Cabo San Lucas, Mexico, during the bye week with several teammates. 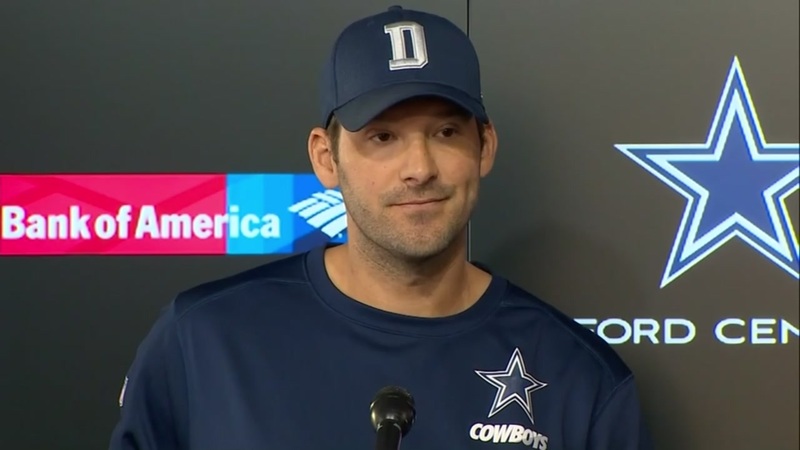 Romo didn't help his perception after the 2008 season finale, a 44-6 loss at Philadelphia that kept Dallas out of the playoffs when he infamously said, "If this is the worst thing that will ever happen to me, then I've lived a pretty good life." As time passed, Romo seemed to understand why that quote struck a nerve for followers of America's Team. And he gave them the only playoff victories for the Cowboys since their last Super Bowl title following the 1995 season. The most recent postseason win - in the wild-card round against Detroit - came during the last season that Romo was the full-time starter in 2014. The next season, he missed 12 games with a twice-broke left collarbone as the Cowboys went first-to-worst at 4-12. When Romo broke a bone in his back on an awkward tackle from behind in the preseason at Seattle, Prescott had already shown promise in the first two exhibition games. After losing his regular-season debut to the New York Giants, Prescott guided the Cowboys on their record streak, with Romo as his backup for the final three wins. While chided for his interest in golf and celebrity girlfriends, Romo developed a reputation for toughness. He led two fourth-quarter comebacks on the road with serious injuries - fractured ribs and a punctured lung at San Francisco early in 2011 and a herniated disc in his back at Washington two years later.